The New York Racing Association (NYRA)’s 24/7 cable television network, NYRA Network, is using Hitachi SK-HD1000 HD cameras for live coverage of major races from the sport’s largest regional venues. In addition to providing live coverage of horse racing’s three major regional tracks—Aqueduct, Belmont and Saratoga Springs—The NYRA Network also offers simulcast signals from around the country on dozens of monitors set up for each specific race meet. The Hitachi SK-HD1000 is Hitachi's third-generation HDTV camera. 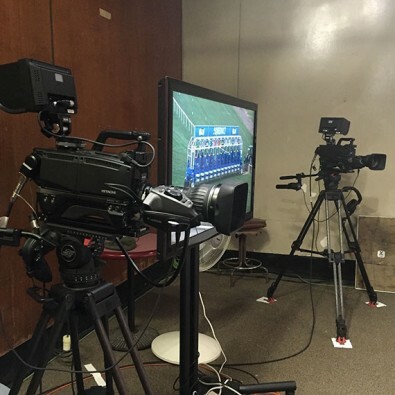 The 12 SK-HD1000 cameras are used in tandem with NYRA TV’s two mobile production trucks, as well as several remotely operated Hitachi cameras that are mounted in Telemetrics housings around the track. Most of these are taken down following a meet, although several permanent systems are used throughout the year to provide viewers with live “look-ins” of the track during the off-season (showing training sessions and other non-meet track activities). Some meets, like Saratoga, last six weeks, so the NYRA TV truck pulls up and sets up the cameras around the racetrack. Six cameras are configured as full “hard” cameras on a platform, complete with long (70x) lenses to capture to maximize dramatic impact of racetrack action. NYRA TV also streams the live events (on NYRA.com) and the look-ins at the various racetracks. With its 2-piece, dockable design, the SK-HD1000 is a multi-format output camera system that outputs dual formats (SD and HD) simultaneously. As an option, the camera can be used to cross-convert 1080i (50/59.94) or 720p (50/59.94) HDTV signal formats and SD at the same time. Its circuits' miniaturization yield not only the smallest most flexible Hitachi HDTV camera to date, but also one of the "greenest" and most power efficient (16W camera head power consumption) cameras on the market.